<<< Fun for all ages ~ and the best people-watching to be found outside the big city! Thank goodness the weekend is finally here! And a long one at that! Ever have one of those days at work? I outdid myself on TGIF Friday! So much so that I’m still celebrating the end of the work week. I’ve always wondered about those signs you see posted everywhere. The ones in restaurant bathrooms telling the staff to wash their hands before returning to work. Or the notices on plastic bags telling parents it’s not a toy for their child’s entertainment. I’ve been dying to know who needs to be told these things. After Friday,I’m much more humble about the whole thing! They are busy people, preoccupied people, forgetful people and, yes, stupid people. In short…they are…me! Well, I figure it’s not every day I make someone’s best last day, so I’ll just leave it at that. But I feel the need to celebrate that the week is over so why not give away some books? 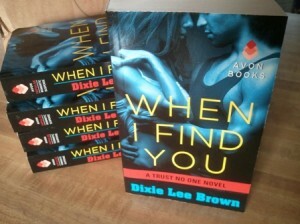 Four lucky people will each win a signed paperback copy of WHEN I FIND YOU. Enter as many times as you’d like and please feel free to spread the word. I love comments, and I hope some of you will be brave enough to share an embarrassing moment with me so I’ll know I’m not alone. This entry was posted in Books and tagged All Or Nothing, Avon Books, Dixie Lee Brown, Romantic Suspense, Trust No One, When I Find You. Bookmark the permalink. 6 Responses to TGIF and beyond! Well, one night headed into work (nightshift) and I’d been there a few hours until someone finally noticed (and thankfully pointed out to me!) that my pants were on inside out!!!!! Oh no, Sue! That’s when you find out who your real friends are! One of my embarrassing moments came in my early 20’s. A girlfriend and I were leaving a late showing of a movie and a creepy guy seemed to be following us. I looked over my shoulder to see if he was still behind us as we hurried to the car. I didn’t see the guy, but I saw stars because I walked right into a light pole. I had a black eye for a couple of weeks afterward. It was embarrassing to explain how I got it whenever someone asked what happened to my eye. Well, one embarrassing episode occurred while camping. I decided to steam some vegetables and filled one pot with a bit of water, placed a smaller second inside and put on the lid. I didn’t bother to pay attention and the small quantity of water quickly evaporated and the burner continued to heat the stove until it burn a hole right through the bottom pot! It was a brand new cookware set and I was quite embarrassed when I returned it back for an exchange to a local retailer. Ouch! That hurts in more ways than one! Well, thank goodness you were safe from the creepy guy! Thanks for sharing, Katherine. Saulius, I feel for you! The water was really to blame – right? Thanks for stopping by.